After the KCC farmers market, Roomie #1 and I are always starving. We go with every intention of getting breakfast at the market but usually end up leaving as quickly as we can to avoid the crowds. Today’s big farmers market finds were beautiful Big Island tomatoes for $3 a pound (those suckers are at least $7 at the grocery stores here!) and some little sweet potatoes. I expected them to be the red skinned, white fleshed version but they turned out to be an absolutely gorgeous deep purple inside. To celebrate these awesome veggies and use up some of the huge amount of swiss chard growing in the garden, I decided to throw together a quick, simple breakfast hash. To make it a complete meal, I quickly poached some eggs and grabbed the salsa from the fridge. Vola! A fancy looking breakfast in less than 30 minutes. 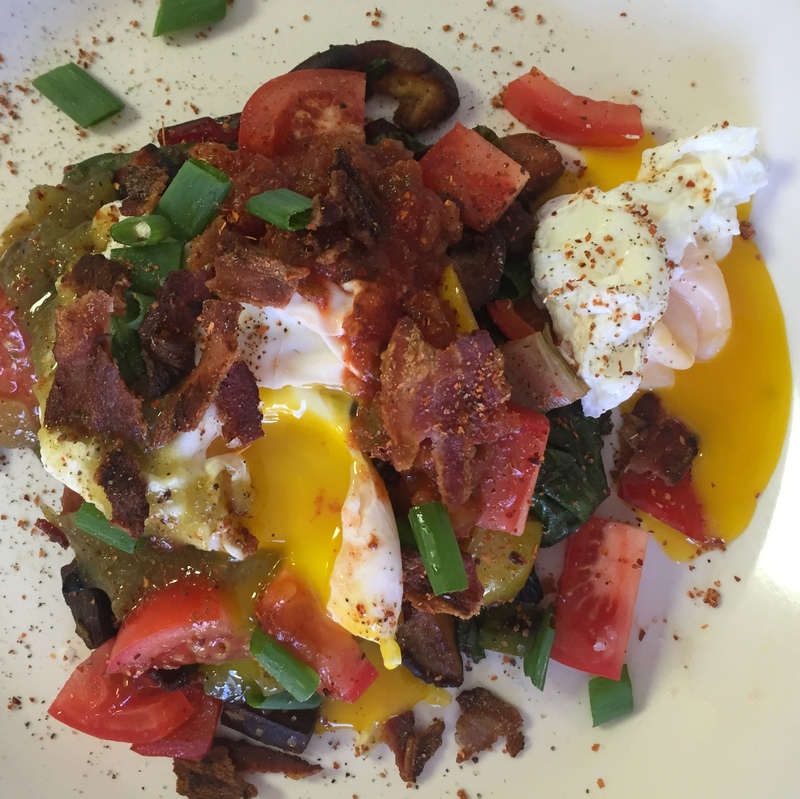 I added bacon to bump everything up a bit…yum! This method of cooking the sweet potatoes can also be used to make easy home fries without parboiling. Just chop up your potatoes, toss them in a large skillet over medium heat with a little olive oil (or bacon fat if you are having bacon with your breakfast! ), and cover them up. Cook your potatoes, stirring occasionally, until they are cooked through. Then remove the lid and season them to your liking. If you season beforehand, the spices get burned and bitter so wait until the end of the cooking process.